« We have one brand, it’s called Cork! I was having a lazy Saturday morning, cup of coffee in hand, a delicious cheese swirl that I had bought in Dunnes Stores last night, flicking through the newspaper, which had been delivered by the milkman and contemplating if the rain would stop so I could consider a walk in the park with the dogs. I have some work to do today as we are really busy but for now I’ll flick through the channels and enjoy my cuppa. I stumbled onto CNN news and as usual there was the daily digest of Trump hatred, who to make an ugly point is sending 15,000 troops to the border to stop a caravan of refugees, who according to reports are weeks away. Why does he get so much satisfaction from his constant stream of lies and propaganda and in truth the throngs of people at his pre-Midterm rallies seem to sadly, lap it all up? They proceeded to show a video of a malnourished child in a hospital in war torn Yemen, which was heartbreaking. The skin and bones and gaunt face with a swollen belly showed a person, a defenceless human being looking at the camera. When the segment finished the CNN new anchor had to compose himself before continuing with other news items. The warning was right, the video was disturbing, and while it was dreadfully uncomfortable to look at while relaxing on a Saturday morning in the comfort of my own home, it’s really important that we do not turn away. 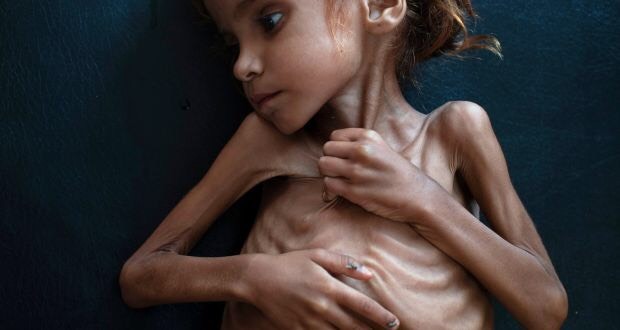 The image shown was that of Amal Hussain, who passed away one week after this photograph was taken in Yemen. Click here to listen to the podcast with the photographer (Tyler Hicks – New York Times) who captured this haunting image, that captured the world’s attention. How is it that these problems still exist in our world…what is wrong with us? Amal, you beautiful girl – I hope the next life is better than this one was for you. This entry was posted on November 3, 2018 at 4:36 pm and is filed under Caring, Charities, Racism. You can follow any responses to this entry through the RSS 2.0 feed. You can leave a response, or trackback from your own site. It’s just heartbreaking, isn’t it? It is just awful – how is this happening? I don’t know – regional rivalries between countries that have the money to carry them on and people in power who are strengthen their positions. They’re not the ones who feel the effects though.